On the international day of Peace, UCLG and its Committee on Development Cooperation and City Diplomacy, wish to recall that in the past decade, over 15 million people have lost their lives and over 40 million people have been forced to flee their homes as a result of ongoing threat of conflicts. Local governments have important roles to play in conflict situations: they have to ensure that service delivery continues to be in place and they can foster peace. These roles have so far been insufficiently recognized. The theme of this year’s commemoration is “Partnerships for Peace – Dignity for All” which aims to highlight the importance of all segments of society to work together to strive for peace. Next week, the UN General Assembly will approve the Sustainable Development Goals. Goal 16 is dedicated to the promotion of peaceful and inclusive societies. This represents an important opportunity to show that local governments are instrumental in preventing conflict, building bridges and dialogue and promoting peace. In order to draw further international attention to local governments that implement innovative strategies for conflict prevention, peace building and post conflict reconstruction, and to promote the exchange of initiatives, UCLG and its Committee on Development Cooperation and City Diplomacy will shortly present the UCLG City of Bogotá Peace Prize.. The Peace Prize will award the most innovative practice on peace at local level. 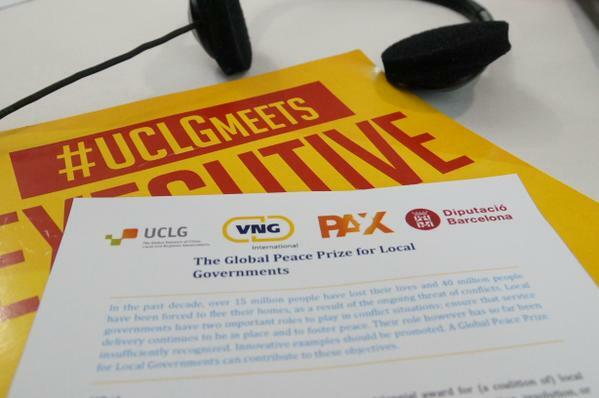 More information will follow soon on peaceprize.uclg.org.